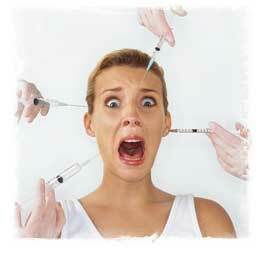 IF YOU ARE needle phobic, the good news is that Topical Botox is coming – probably available sometime in 2013! Yes, it’s true… totally painless topical Botox applied without needles! It appears to work and well. But before you get too excited, here’s the disappointing part. So far it’s only been proven to work for crows feet – those fine lines radiating outward from the outer corners of your eyes. And don’t expect to purchase it at your nearby pharmacy. It will still need to be applied by a physician. They tells us because of the process in preparing and applying it, but I wonder . . .
It’s coming, and it seems to be a very cool skin care technology. Stay tuned.